Are you one of the women that likes dinosaurs? If you do then you have to see this fun t-shirt. On this shirt you can see a dino and I think it’s a Titanosaurs. And then there is a big letter I and a big heart. 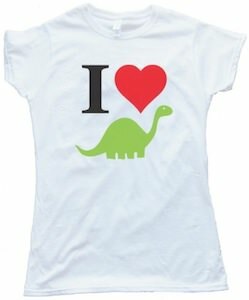 So basically this t-shirt says “I Love Dinosaurs” or “I love Titanosaurs”. This Dino love t-shirt comes in the colors light blue, pink, white and yellow and is available in sizes Small – 2XL. And this dinosaur t-shirt is made from 100% cotton and is printed in the USA. Get ready to show the world what you really love and start by ordering this I Love Dinosaurs Women’s T-Shirt.